Eastern Cross atop a Dwajastambham. snapshot, was the southern part of Kerala! shores for centuries. They have left their mark — a 400-year old synagogue, churches that resemble Hindu temples and also ancient mosques set up by Arabic traders, long before the advent of Islam via the Turkic invasions. The first mosque ever built in India was in Kerala. 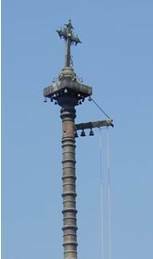 Of course, many old and ancient temples are open for worship with tens of thousands of devotees offering vazhipaadu (special worships) and fulfilling nerchas (vows) unbroken through very many more centuries. 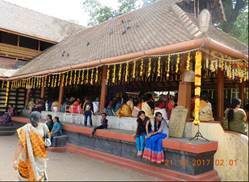 This setting of various places of worship reflecting so many major religions is a reflection of the makeup of the denizens of Kochi. Hindus are 44 % of the population, followed by 38 % Christians, and 18 % Muslims. 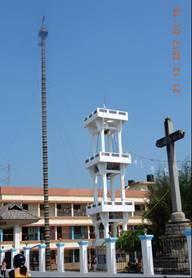 There is very little religious strife in this town unlike many other cities in India. The high literacy rate of 98% in Kerala could be one reason. 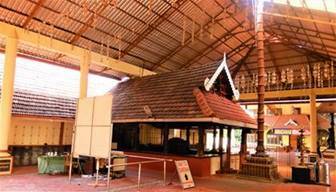 The Bhagavatghi Temple in Alappuzha. narrow canals barely 20-feet wide and navigable only in motorized canoes. It was amazing how people have made a lifestyle along this maze of intricate waterways. Temple worshipped by Adi Shankara in Kaaladi. 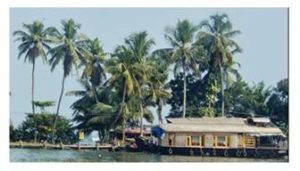 A house boat in Kerala Kaayals. hopes they find a way to rid these pests from destroying the natural flora and fauna of the waterways. 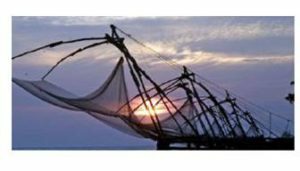 backwaters, seafood is a staple in the Kerala diet for many. People use the waterways to go to work (see the photograph below). These special ferries worked like bus routes along the waters. 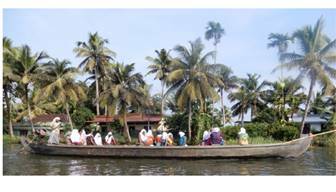 A “commuter” boat in the Kerala backwaters. This entry was posted on July 22, 2018, 2:43 pm and is filed under July 2018, Past issues. You can follow any responses to this entry through RSS 2.0. You can skip to the end and leave a response. Pinging is currently not allowed.